Lower back pain can be caused from a torn or pulled muscle or ligament. Sometimes lower back pain is the result of lifting a heavy object or from a sudden movement. Lower back pain can also result poor posture or a sports injury. No matter the cause, this restorative yoga class for lower back pain can help turn off the stress response to lower back pain so that your lower back can rest and repair. When you experience lower back pain your body gets the message that your sympathetic nervous system kicks into high gear with stress response and your body believes it is being threatened and under a harmful state of attack. 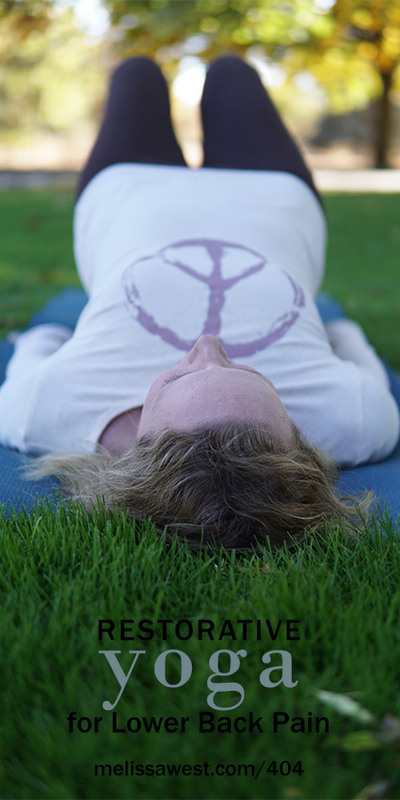 With restorative yoga, you receive the time to settle and drop in. Your brain will receive the message that you are safe and the stress response of the sympathetic nervous system can turn to the parasympathetic nervous system so that your body can begin its relaxation response and healing. As we take the shapes of restorative yoga for lower back pain we are creating space for your breath to flow to your lower back. You can begin to rest on the props and the ground so that your body will be held. This will allow your breath to flow into the space created in your low back so that there is increased blood flow and increased lymph flow. The natural deeper breathing sends the message to your brain that you are safe, deepens your relaxation and enhances the healing of this restorative yoga for lower back pain. When we are well supported by the ground and through props in restorative yoga, we can have the experience of being cradled and protected. All day long we control our experience through gripping, holding and tension. The support of the ground and props offers us the opportunity to release the gripping, holding and tension so that we can experience a deep level of relaxation and healing. Best: The best way to make yoga a part of your everyday life is to join our membership community. It is there that we can support you in making yoga a part of your daily life with our curated content in our DYC and We also have over 10 yoga videos for back pain, plus specific videos for sciatica, herniated discs and SI joint issues. We would love to welcome you into our membership community where we keep our best value added content for our members and will support you in your restorative yoga practice.